Sporty support raises funds in memory of Alfie and Pippin. A great big thank you to Michelle Hasty who completed several sporty events last year to raise funds for our charity. Michelle managed to raise a staggering £565 for our charity, far exceeding her goal of £350! Michelle decided on a ‘Pyramid of Events’. Completing a minimum of 8 x 5k parkruns; 4 x 10k running events; 2 x half marathon and 1 sprint distance triathlon! “I have chosen to support The Animal Rescue Charity (ARC) in Bishops Stortford as it is a local charity known to many and is where we got Alfie and Pippin. 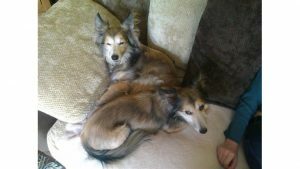 ARC do a wonderful job rescuing and rehoming many animals, not just dogs. If it were not for ARC taking them in we never would have found them and they would not have been such a massive part of our lives”. If you would like to do a fundraising event for us you can easily set up a Just Giving page and select our charity. We cannot express how grateful we all are for your support and how important your donations are.